OK. You've heard the term IoT or Internet of Things. First, what the heck is that? And second, why do you care? 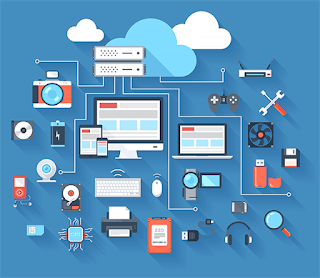 - Everything connected to Alexa, Amazon Echo, Google Assistant, Siri, etc. What does that mean? Well, the average household will soon have a dozen IoT devices. But in just a few years it will have hundreds. And across the country there are currently hundreds of billions of devices. Soon it will be hundreds of trillions. Most of these devices ship with a default password that you are not required to change upon setup. And, not surprisingly, the username is often "admin" and the password is often the same. In other words, anyone can guess the passwords to millions of devices as a time. There has rarely been a better opportunity for hackers to break into insecure networks! Step One - Change Passwords! This seems obvious. But we've already seen major attacks. Hackers use these devices to create massive denial of service attacks. Less common are attempts to break into secured networks. But if these devices are using default settings, they could be used to monitor network traffic - including your username and password. The easiest first step: Change Your Password. This is literally like not leaving your car keys in the ignition. You might think this is expensive, but it's not. First, consider what you just spent on a devices. If you're buying thermostat and lighting systems for several thousand dollars, you should spend a few hundred to keep them secure. NOTE: This is just a sample network "map." There are many options. A network professional can help you set up something different. For example, you might add a secure "segment" off of the business firewall. Ask a professional to look at your network and desired outcome. I hope your business network is properly protected with a business-class firewall. 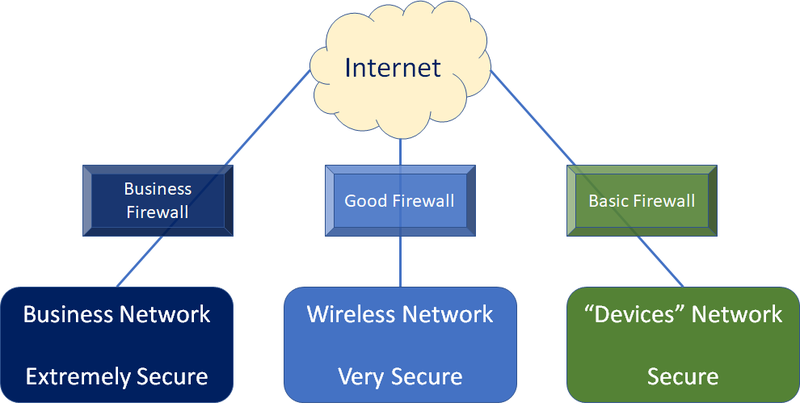 Your wireless network (at business or home) should also have a firewall. This does not mean the Internet router. That might technically have a firewall, but it's not intended to replace a real firewall. And if you have a wireless network, I hope it is properly secured. I am recommending that you create a third network (or network segment) to isolate all your IoT devices. That way, no matter what happens with door locks, cameras, TVs, thermostats, etc., you business is absolutely secure. 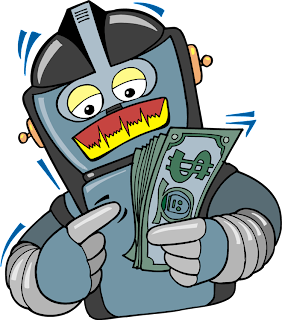 You've seen all the ransomware attacks in the last year. Essentially, all of these attacks take place by finding microscopic holes in networks. Unpatched software and operating systems provide these holes. Remember: the Internet of Things is inherently insecure. It's basically a network of holes! Keep that away from your business network. Step Three - Document It! One of the greatest weaknesses of technology today is that it is "easy" to get things working. Yes, you might spend a few hours fiddling with it. You might call tech support. But eventually, you get it going. And then you start using it and forget one critical step: Documentation. It's important that you file away all the paperwork for you network-connected devices where you can find it. And it's even more important that you write down configuration settings. This starts with usernames and passwords. But it should also include a network map (diagram) and any important settings that make the system work. As always, I encourage you to get help from a professional. Yes, you might be able to make it "work" at some level. But you may create a slow network that could be much faster. Or you might accidentally bypass the secure firewall and expose your network. 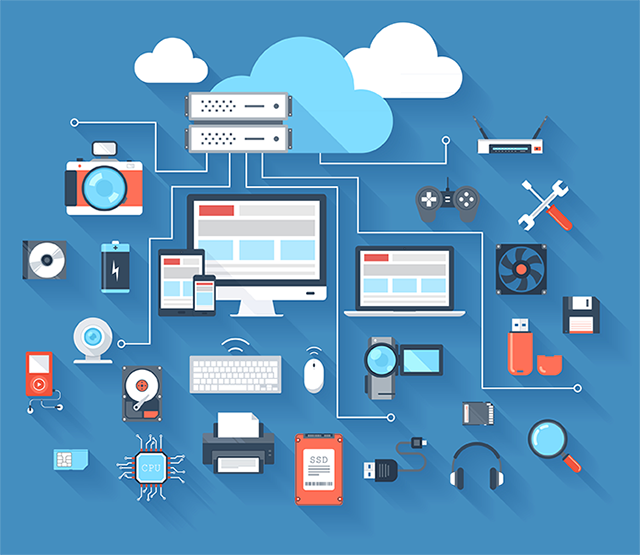 In the end, a professional will help you get the most out of your IoT devices . . . without putting your secure data at risk. And, no, I'm not available to help you. You can't afford me. But if you're looking for someone, drop me an email and I might be able to help you find someone in your city.